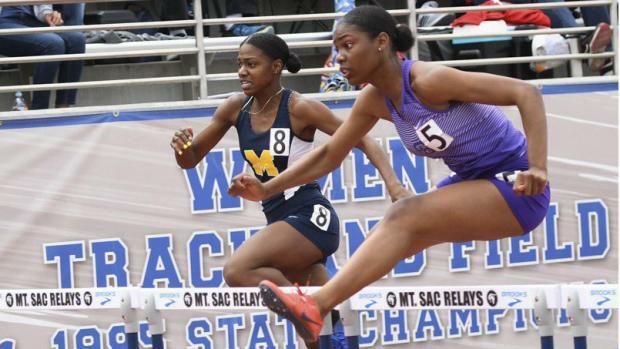 Jazmyne Frost of Serra embarks into senior campaign as one of the best in the nation! California State Meet runner-up in the 100 meters (11.57 best) is the overwhelming favorite to defend her titles in the 100 and 200 (23.65 best). Anchoring her squad to the State Title in the 400 Relay, coming back to assist on their runner-up placing in the 1600 Relay, Frost sandwiched in a third-place finish in the 200 meters as well! She not only led her squad to the Division 4 team title a year ago but cemented the Cavaliers' dream season with the California State team title! 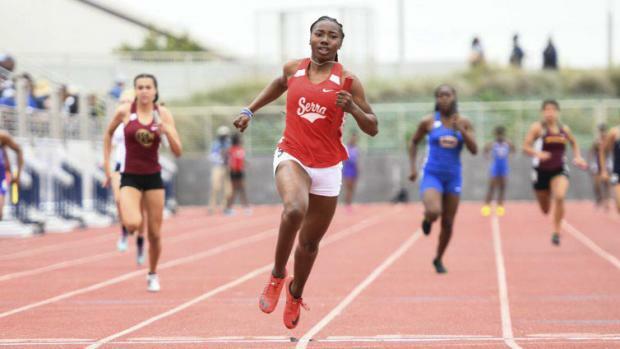 Serra, however, lost a member of their championship team when Queen Okoh, runner-up in the 100 meters (11.97), transferred to Long Beach Poly. Runner-up to Frost a year ago for the 200 meters (24.73), Muir's Jenesis Sanford returns while she was also third in the 100 meters (12.07). If Oaks Christian looks to recapture the team title, it will be on the legs of their incredible sophomore group. Jahzara Richardson (12.15 / 24.85 bests from 2018) will play a major role. She placed fourth at last year's finals in the 100 meters. Fellow sophomore Brooklyn Courtnall comes in with a 56.52 best in the 400 meters. She is joined by Hannah Wilson (57.29 best) and Raeshell Austin (58.59; sixth in the 400 meters last year). Standing in their way, those quarter milers will have to take on the talent of defending divisional champ, St. Bernard's Sydney Bentley (55.71 best). Bentley also took third in the 200 meters (24.87) a year ago while placing eighth in the 400 meters as the SS Masters Meet. Chasing Bentley in both sprints, Isreal Conerly of St. Mary's was third in the 400 (57.34 best) and crossed in sixth place in the 200 meters (25.24). Another top tier talent in Division 4 is Archer's Nia Mosby. Her 12.28/24.98/57.08 resume from 2018 provides her with range unmatched in the division, aside from Frost. Moving to the hurdles, St. Anthony sophomore Asjah Atkinson stole the show a year ago with her 14.34 title in the 100 Hurdles. She would advance onward to a seventh-place finish at the California State Meet, leaving with a 14.24 wind-legal best. Atkinson also dominated in the 300 Hurdles with her 44.44 Division 4 title as well. (She is one of the best long jumpers in the division). Thacher's Caroline DelVecchio was third a year ago in the 100 hurdles (15.01) while Paraclete's Brianna Smith (15.65) and Archer's Starlynn Brown (15.83) was fifth and sixth respectively. Smith doubled up with a third-place finish (47.20) at last year's Division 4 Finals as well. Oaks Christian's Tasha Bierling (47.41) was fourth a year ago with DelVecchio placing fifth. Over the past several seasons, Division 4 has boasted some of the best talents in the Southern Section in the distances. In the 1600 meters, two freshmen fell from the sky in Mia Barnett of Village Christian and Audrey Suarez of Mayfield. 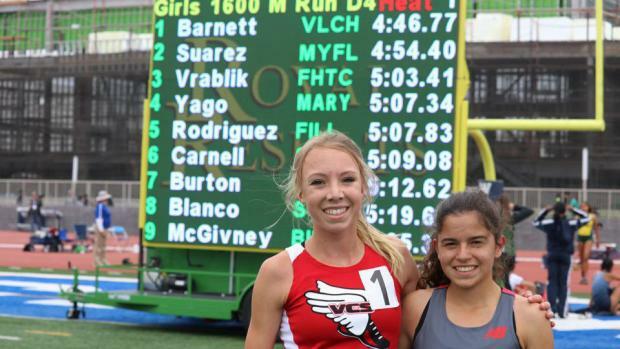 Training partners off the track, Barnett captured the Division 4 title (4:46.77) in the 1600 meters en route to her sixth-place finish at the California State Meet. Runner-up to Barnett at the divisional finals, Suarez propelled herself to a fifth-place finish (4:47.83) at the State Meet. Both were the top two freshmen in the nation a year ago. Returning with the top time in the division in the 3200 meters (10:18.68), Malibu's Claudia Lane is working her way back to her regaining the 3200 title from her sophomore season. She also added a 5:00.81 to her 2018 resume before prematurely ending her season to heal from injury which also derailed her senior Cross Country season. Reflecting back to the 3200, Barnett took that title in the event a year ago with a 10:27.82 while Suarez doubled back for a runner-up finish in the 800 meters (2:13.28). Regarding the 800 meters, Oaks Christian will receive a nice boost as Janiah Brown transferred from Calabasas to join the Lions. Brown comes in with a best of 2:13.37 and after her third-place finish in Division a year ago, she qualified to the Southern Section Masters Meet. She will play a major role for both in both relays (58.02 personal best) as well. Previously mentioned, Hannah Wilson (2:14.26 best) was third in Division 4 a year ago in competing that tough 400/800 combo as her older sisters also excelled at for Oaks Christian. 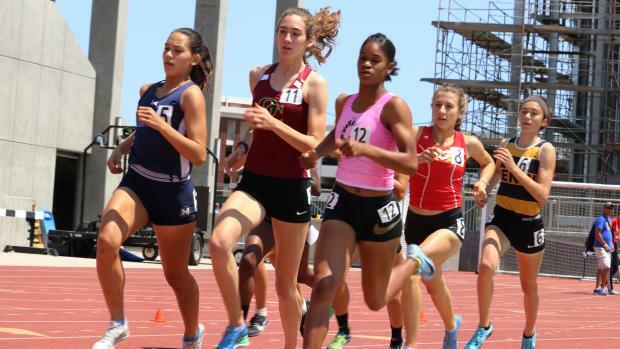 Serra's Maya Rush left her 2018 freshman season with a 2:16.46 best and will counteract that Oaks Christian attack. Rush was eighth place a year ago while Alexandra Lomeli of Notre Dame Academy returns after her fifth-place finish (2:17.25). Dominating on the Cross Country courses this past fall, Foothill Tech brings their depth to the track. Hana Vrablik (5:03.41) was third place a year ago in the 1600 meters. Also returning is Lauren Kearney, third in the 3200 meters (11:06.52) in 2018 with fellow senior, Blythe Blakeman crossing in fifth place. Wildwood's Asha Fletcher returns to defend her Division 4 title in the Long Jump (18-10.75). 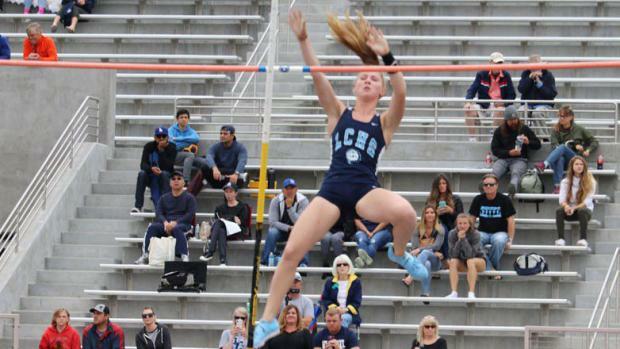 Seemingly off the radar to most, she flew out to a 19-3 wind-aided effort at the California State Meet and earned herself a third-place medal. Valley Christian's Kennedy Wesley placed fourth a year ago while the aforementioned hurdling sensation, Asjah Atkinson was fifth as a freshman at the 2018 Division 4 finals. In the triple jump, Marymount's Skye Embray (36-0.5) was third a year ago with Cate's Rivers Sheehan placing fourth (34-11). In the high jump, St. Margaret's Emily Sun and Pasadena Poly's Zoey Mao both cleared 5-3 at the 2018 Division 4 finals. With Sun earning the title based on misses, she moved forward to the Masters Meet and just missed qualifying with her seventh-place finish. But, it's Linfield Christian's Caylan Medley and Archer's Miaya South that have the top returning marks as both cleared 5-4 during the 2018 season. Moving to the pole vault, Linfield Christian's Kaelyn McCann is the defending Division 4 champion with her 11-6 performance last year. She advanced onto the Southern Section Masters Meet, where she finished in 12th place. Archer's Miaya South excels her as well, as she was the runner-up a year ago, but also had a personal best of 11-6. Grace Brethren's Grace Chen placed third (10-6) at the Division 4 finals last year as a freshman. A host of girls that cleared 10-0 a year ago are led by Louisville's Phoebe Joseph and Mayfield's Mia Koga as both tied for fourth at the 2018 Division 4 finals. 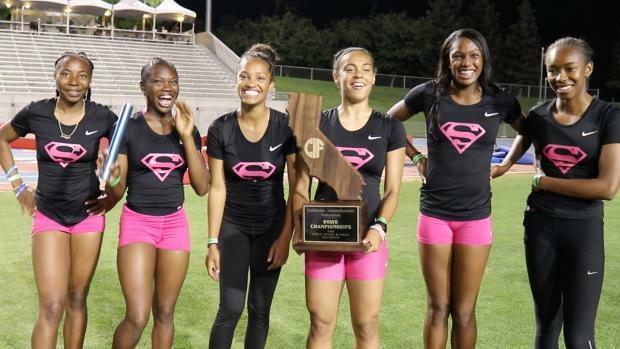 As Serra excelled with their sprinters a year ago en route to the team title, they also received valuable points from Erin Brown. She placed brought back 16 points with his victory in the Discus (125-2) and the third-place finish in the shot put (39-2.5). She qualified for the SS Masters Meet in both events and is the heavy favorite to capture both events in 2019. Desert Christian's Daphne Ebenhack placed fifth in the shot put last year (36-11.75 best) while St. Paul's Danielle Mataele returns with the second-best mark (37-7) from a year ago. Mataele qualified for the Division 4 finals in both events last year. Aleena Garcia of St. Paul peaked with her best (113-4) with a fourth-place finish in the discus. Meanwhile, Fillmore's Cynthia Hurtado had a seasonal best of 113-6 in the event.